In May 2010, Grand River Technical School faculty and staff began the tradition of honoring an educator from one of the 16 schools that send students to GRTS. The "2011 Outstanding Sending School Educator Award" was presented to retiring Bosworth R-V Counselor, Dixie Wilson, who has been an educator for 45 years. 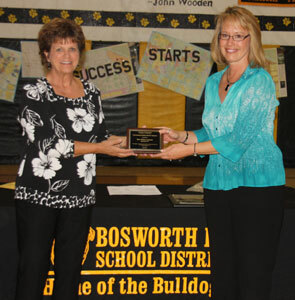 Jayme Caughron, Assistant Director, presented Mrs. Wilson with the award on Friday evening, May 6, at the Bosworth High School Awards Banquet. In addition to receiving a plaque, her name has been added to a perpetual plaque which is displayed at GRTS, and she will be featured on the school's website. Mrs. Wilson has always worked closely with GRTS faculty and staff to do what is best for students and to help those students advance their career goals. She is kind and caring, yet she works with teachers to set clear expectations and hold students accountable for their work ethic and the effort they put into their school work. Mrs. Wilson lives in Carrollton. She is looking forward to spending more time with family and also working part time for Shirley's Shoes & Boots. We will certainly miss Mrs. Wilson at school but wish her much happiness in her retirement. This page updated by BK Web Works 05/29/2013.